In summary - a coordinate reference system (CRS) refers to the way in which spatial data that represent the earth’s surface (which is round / 3 dimensional) are flattened so that you can “Draw” them on a 2-dimensional surface. However each using a different (sometimes) mathematical approach to performing the flattening resulting in different coordinate system grids (discussed below). These approaches to flattening the data are specifically designed to optimize the accuracy of the data in terms of length and area (more on that later too). In this lesson you will explore what a CRS is. And how it can impact your data when you are working with it in a tool like R (or any other tool). 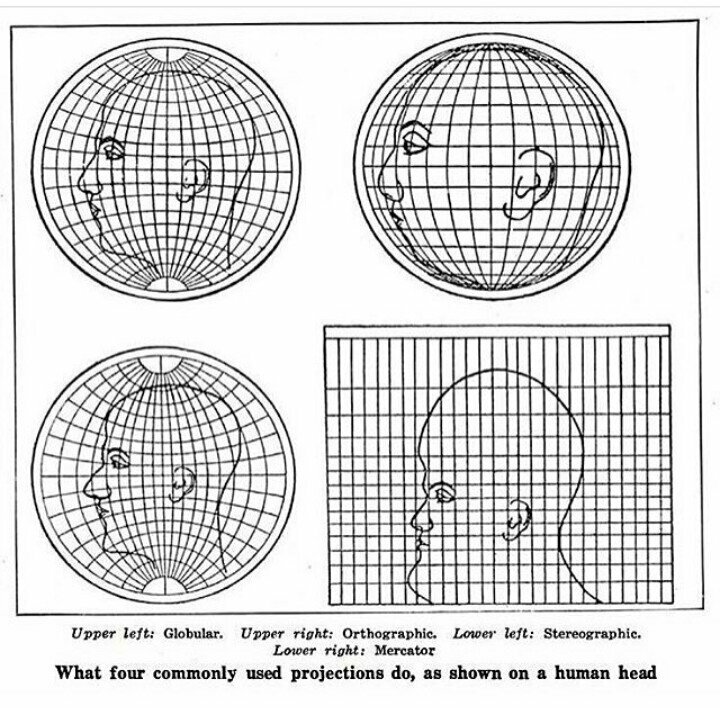 The human head projected using different coordinate reference systems. SOURCE: Scientific American. Do any of these happen to bare a striking resemblance to Jay Leno? While the above coordinate system is 2-dimensional, we live on a 3-dimensional earth that happens to be “round”. To define the location of objects on the Earth, which is round, you need a coordinate system that adapts to the Earth’s shape. When you make maps on paper or on a flat computer screen, you move from a 3-Dimensional space (the globe) to a 2-Dimensional space (your computer screens or a piece of paper). The components of the CRS define how the “flattening” of data that exists in a 3-D globe space. The CRS also defines the the coordinate system itself. Datum: A modeled version of the shape of the Earth which defines the origin used to place the coordinate system in space. You will learn this further below. 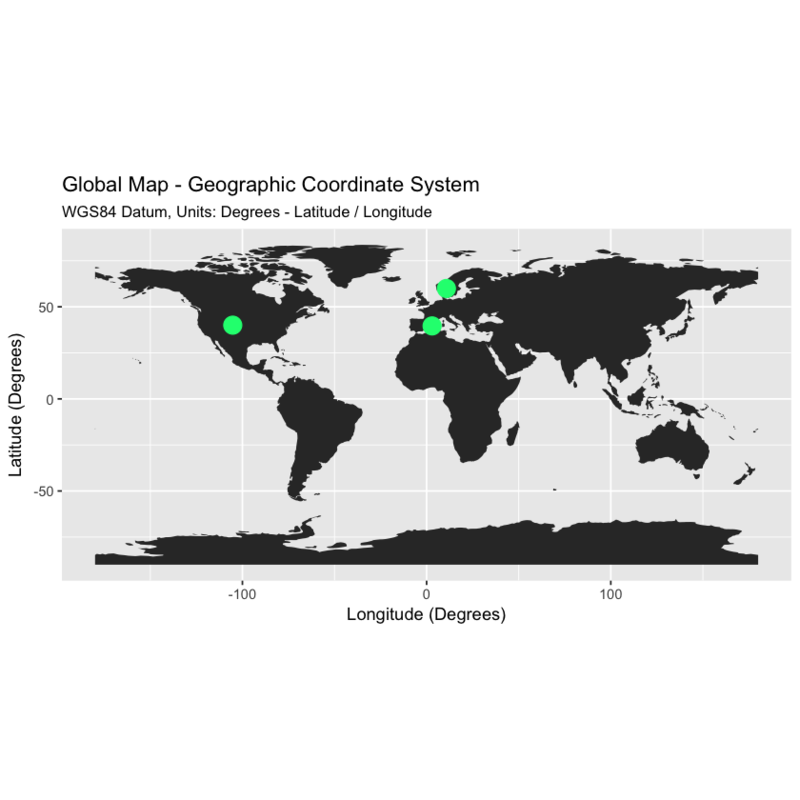 It is important to understand the coordinate system that your data uses - particularly if you are working with different data stored in different coordinate systems. If you have data from the same location that are stored in different coordinate reference systems, they will not line up in any GIS or other program unless you have a program like ArcGIS or QGIS that supports projection on the fly. Even if you work in a tool that supports projection on the fly, you will want to all of your data in the same projection for performing analysis and processing tasks. # testing the sf package out for these lessons! In the plot below, you will be using the following theme. You can copy and paste this code if you’d like to use the same theme! Let’s create a second map with the locations overlayed on top of the continental boundary layer. Geographic coordinate systems in decimal degrees are helpful when you need to locate places on the Earth. However, latitude and longitude locations are not located using uniform measurement units. Thus, geographic CRS’s are not ideal for measuring distance. This is why other projected CRS have been developed. 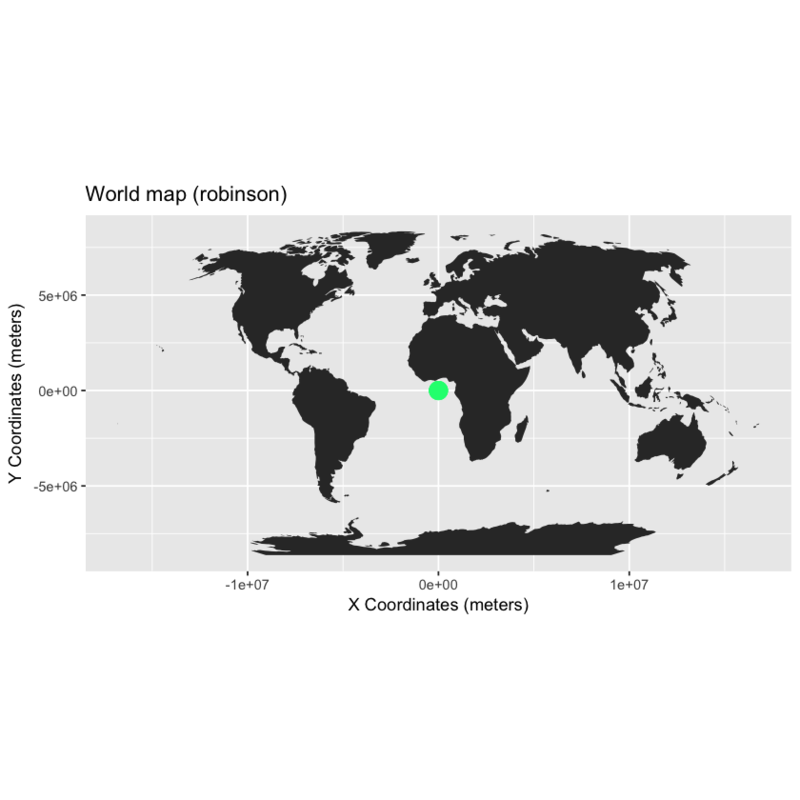 You can view the same data above, in another CRS - Robinson. Robinson is a projected CRS. Notice that the country boundaries on the map - have a different shape compared to the map that you created above in the CRS: Geographic lat/long WGS84. Now what happens if you try to add the same Lat / Long coordinate locations that you used above, to your map, that is using the Robinson CRS as it’s coordinate reference system? Notice above that when you try to add lat/long coordinates in degrees to a map in a different CRS the points are not in the correct location. You need to first convert the points to the new projection - a process called reprojection. You can reproject your data using the spTransform() function in R.
Your points are stored in a data.frame which is not a spatial object. Thus, you will need to convert that data.frame to a spatial data.frame to use spTransform(). Once you have converted your data frame into a spatial data frame, you can then reproject your data. 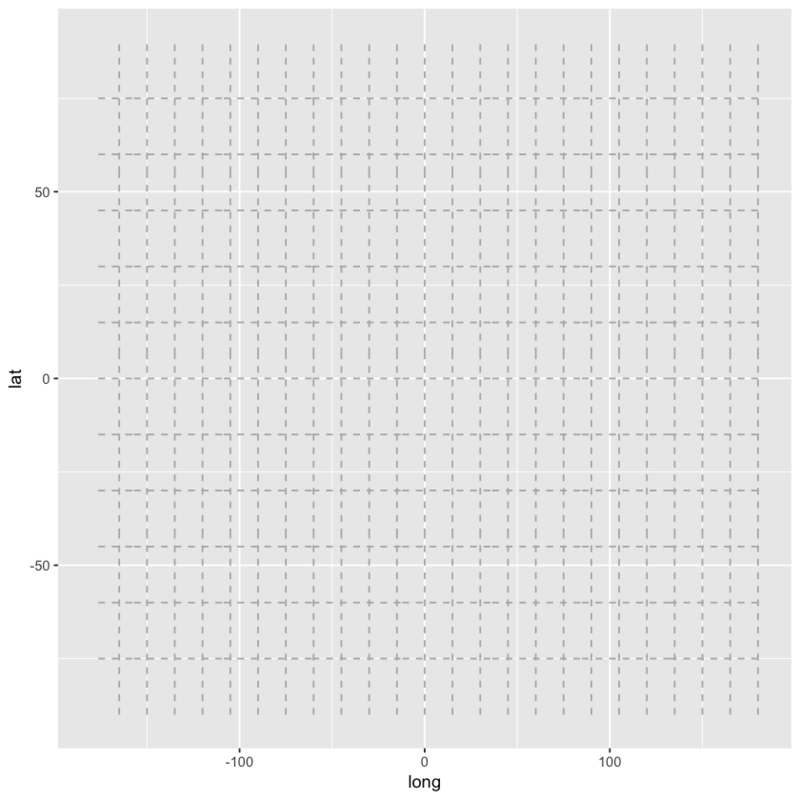 To make your data plot nicely with ggplot, you need to once again convert to a dataframe. 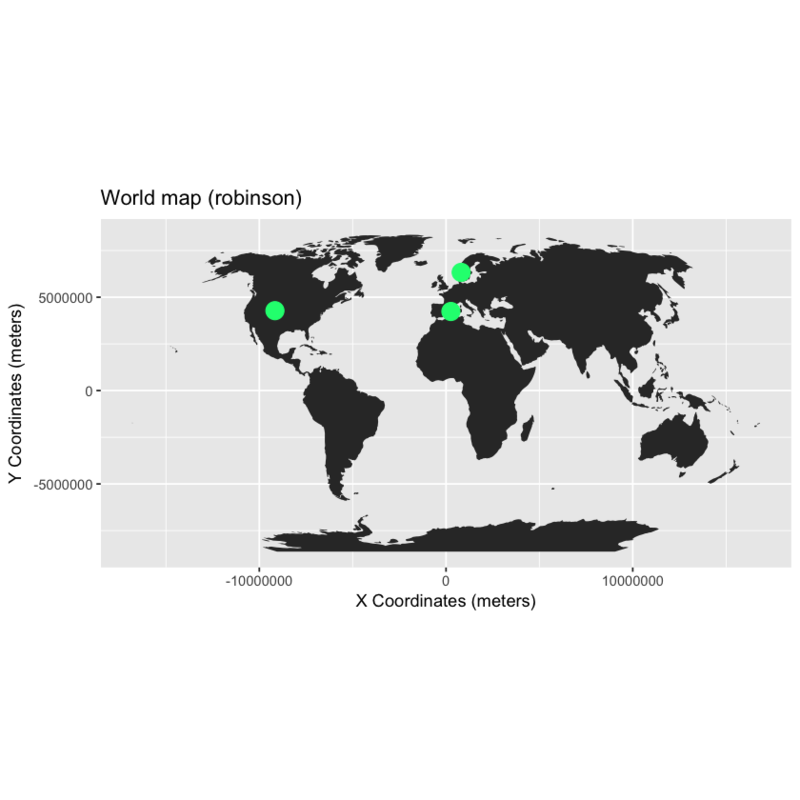 You can do that by extracting the coordinates() and turning that into a data.frame using as.data.frame(). 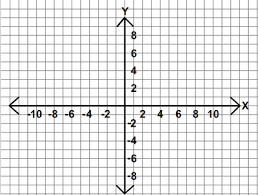 Both of the plots above look visually different and also use a different coordinate system. Let’s look at both, side by side, with the actual graticules or latitude and longitude lines rendered on the map. To visually see the difference in these projections as they impact parts of the world, you will use a graticules layer which contains the meridian and parallel lines. Let’s check out your graticules. Notice they are just parallels and meridians. Also you will import a bounding box to make your plot look nicer! 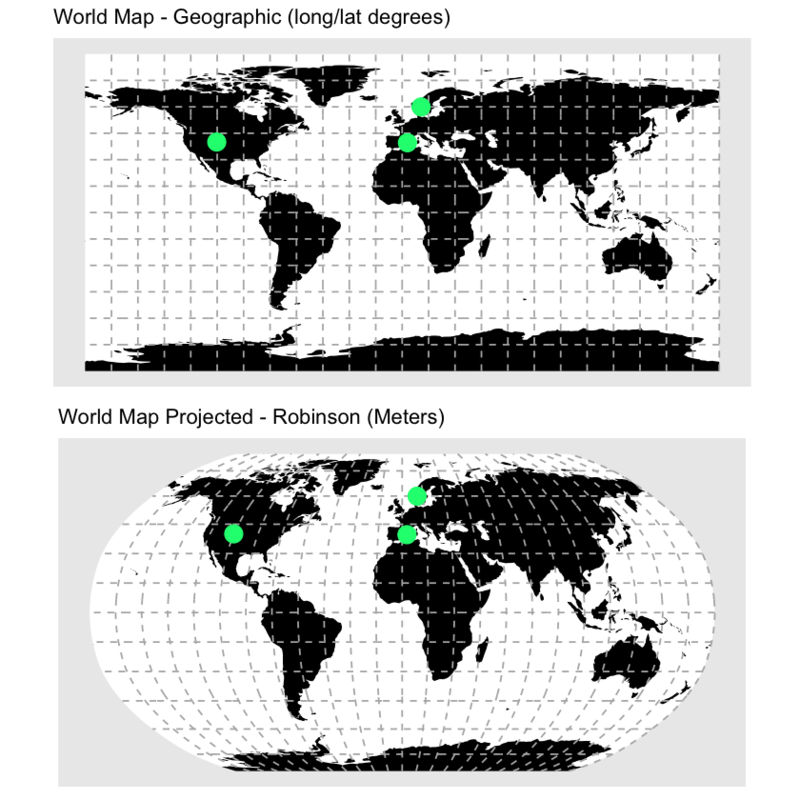 Below, you reproject your graticules and the bounding box to the Robinson projection. Below you plot the two maps on top of each other to make them easier to compare. To do this, you use the grid.arrange() function from the gridExtra package. of features in the data. And no one CRS is great at optimizing all three elements: shape, distance AND area. Some CRSs are optimized for shape, some are optimized for distance and some are optimized for area. Some CRSs are also optimized for particular regions - for instance the United States, or Europe. Discussing CRS as it optimizes shape, distance and area is beyond the scope of this tutorial, but it’s important to understand that the CRS that you chose for your data will impact working with the data. 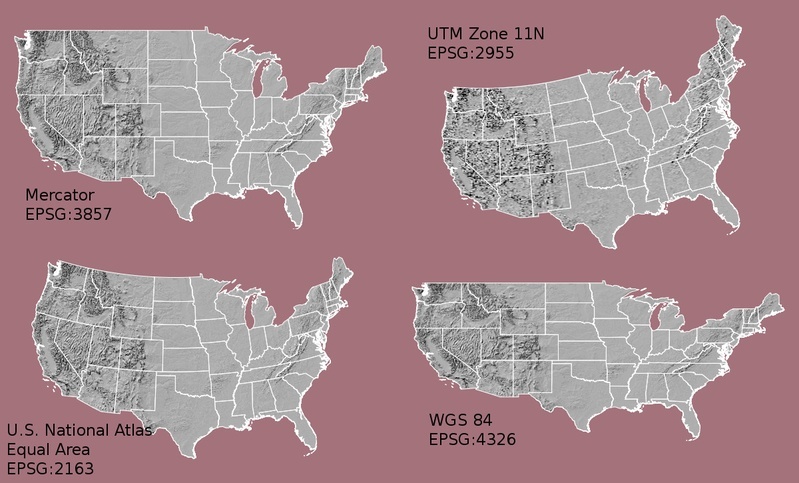 You will learn some of the differences between the projected UTM CRS and geographic WGS84 in the next lesson. Look at the image below which depicts maps of the United States in 4 different CRS’s. What visual differences do you notice in each map? Look up each projection online, what elements (shape,area or distance) does each projection used in the graphic below optimize? You will learn these two coordinate reference systems types in more detail in the next lesson. For more on types of projections, visit ESRI’s ArcGIS reference on projection types.